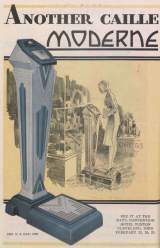 Moderne Scale © 1930 The Caille Brothers Company. New short column type fills every requirement. Accurate mechanism. Modernistic design. Porcelain base and trimmings. Procelain column in two-tone color.